Two schools of motorcyclists exist. Some for whom every road is an invitation to pleasure, sun-dappled woodlands giving way to sunlit uplands, followed in turn by spectacular sunsets. They are called Idealists. The Rest of Us - Realists - see the road for what it is: an endless high-speed ultra-coarse belt sander, a little below our feet, and home to countless two-ton SUVs, their drivers generally biker-hostile and preferring updating their 'social media' profile to wasting time paying attention to anything smaller than themselves. Not to mention all those tired and overstressed truck drivers - soon, in Mr. Musk's Vision of The Future, to be replaced by AI - worrying about their futures, their families, and maybe the stripper in the bar down the road. For us Vanson created Armor. An extra layer of protection between You and The Road? Sounds good - just as long as it doesn't cost you in freedom of movement or comfort. Vanson Armor is specially designed for excellent protection; retained by Velcro fields on the inner face of the leather, fitting unobtrusively behind the lining, it helps keep you safe whether you're wearing a race suit or jacket and pants. All jackets with the (Vanson Armor Ready) icons take shoulder and elbow/forearm armor as well as Back Pads, with access through a zipper in the lining at the small of the back. All pants with the (Vanson Armor Ready) icon take hip and knee or knee/shin armor, with access through the unattached lining at the fly. 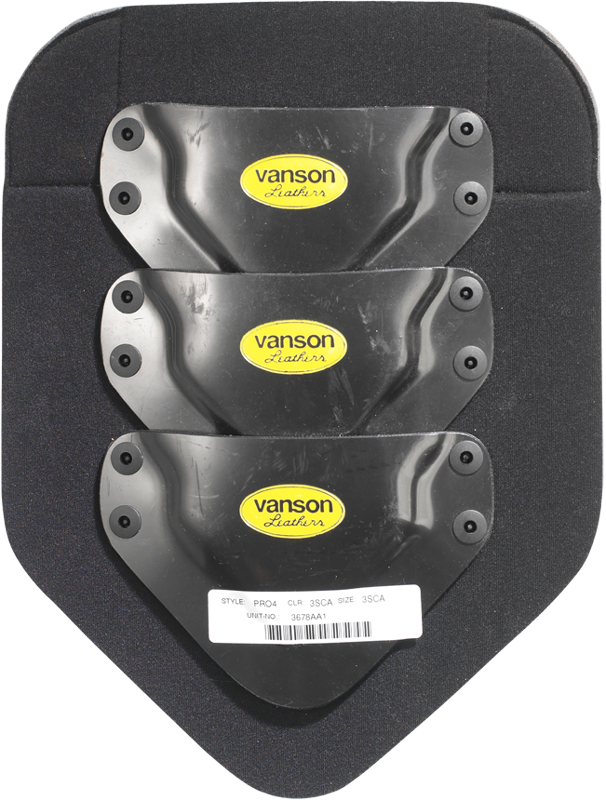 Vanson Street Armor is CE Level 1 approved - and designed to be the most flexible and least noticeable choice for an added layer of protection between you and the road. A very specific type of rubber was chosen to absorb impact and soften the blow of ground contact. Our current generation of hard armor, the fruit of extensive racetrack experience, is the Grand Prix Floating Armor System (F.A.S., patent # ). The armor pieces are assembled at Vanson of a hard thermoplastic disc sewn to closed-cell impact-absorbent polyethylene foam, laminated on both sides to Velcro pile for strength and rigidity, with the edges encapsulated in our 3.5 ounce leather for added protection from the edges of the plastic shell. The Floating Attachment System - shared with our current generation of Soft Armor - brings another important benefit: in an accident the forces of landing and sliding can cause the jacket to pull away from you - the F.A.S. feature allows the armor to stay in position. 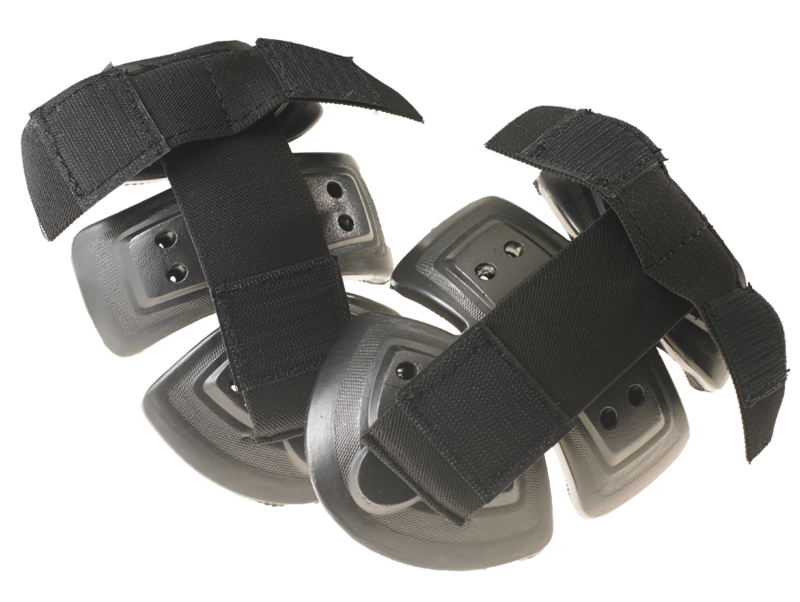 This is a specialized piece of Hard Armor, with a row of hard thermoplastic scales fastened with medical rivets to the same foam backing. It attaches to the jacket with industrial-grade Velcro tabs - one on the liner at the small of the back, the other on a triangular elastic panel at the back of the collar. This system distributes the weight of the Back Pad (varies by size, but around 10 ozs for the -scale version) across the shoulders and away from the neckline, and keeps a proper fit over a wide range of movement. 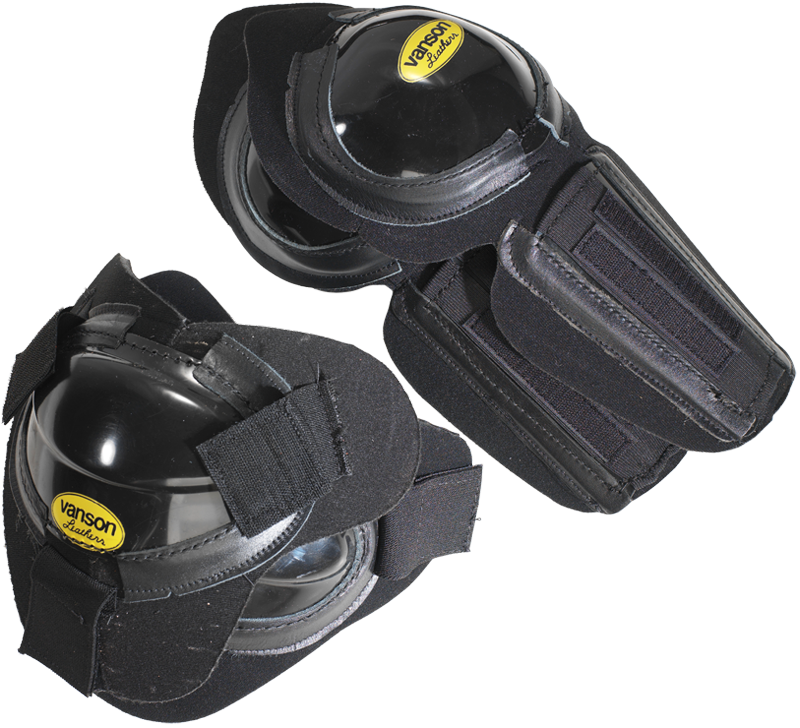 All sizes also available as PROT, with Velcro belt.